Happy Tuesday!! June has flown by so quickly! I can't believe that we're approaching Independence Day. If I don't get to chat, visit, email or otherwise communicate with you this week - please have a happy, safe and fun 4th of July weekend! I love avocados I am going to have to try this! Sounds like a fabulous summer salad! Ooh, where did you get this recipe? It sounds SO good. I wonder if adding some lemon juice would give it some zip. What do you think? Tomatoes, avocados,AND mozzarella..3 of my favorite things. Perfect for the summer. Macaroni salad with AVOCADO and Mozzarella?!! Now that sounds delish!!! The macaroni salad looks awesome! Love avocado! Thanks! This sounds completely delicious! Definitely trying it! I love it! It sounds delicious! Thank you! This sounds delicious and easy. Can't wait to try it! Your macaroni salad sounds lovely - perfect for summer, or anytime for that matter! 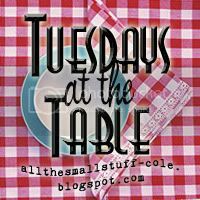 Thanks for hosting Tuesdays at the Table. That sounds delicious (minus the avocado, since I'm allergic). Have you tried adding balsamic vinegar? It goes well with tomato, basil, and mozzarella; I don't know how it would work with avocado. love avocados!!! I linked up with a unique recipe this week; one that calls for kohlrabi. Didn't know if too many people were familiar with kohlrabi, but for those who are here is another way to fix them. thanks for hosting! Yum! First time to join, Happy Summer! I just found your blog listed on Debbie's site. Your recipes look fantastic! Now, about today's posting. My mom use to make this Macaroni Salad that people still inquire about. It was unique and creamy, and you just reminded me that I want to find where I put that recipe!!! ... Besides the cooked macaroni, it also had small chuncks of Velveeta cheese, and pimento, and green pepper and ... humm mmm brain is failing me here. Thanks for the reminder to FIND that!!! Sound yummy! This one's a keeper. OH MY WORD! This sounds so yummy! Love tomatoes, mozarella and avocado. Must try immediately. What adorable puppies! Thanks for hosting Tuesdays at the Table. I wish I liked tomatoes because this sounds amazing! This sounds so yummy!! I am going to have to try it. That sounds really, really good. Very filling! I love summer salads! I just found your adorable blog, such fun stuff. I'll be back and thanks for hosting! That sounds like a great pasta salad. Something a little new. I am going to be trying it out soon!! Thanks!! I love the flavors in your salad. Thanks for sharing it and thanks for hosting. Come join me for What's On the Menu Wednesday whenever you can. This is a great recipe with my favorite things! I hope you'll come over and link up on No Whine Wednesday!